The Reflecting Pool Is Almost Ready!!! Hallelujah! After what seems like an eternity, the Lincoln Reflecting Pool will finish renovations and be refilled once again by the end of August! Renovations of the pool began in 2010 and cost a whopping $34 MILLION! With all that money, it better be filled with Badoit. The Washington Post reported yesterday that the pool will be brought back to its shining glory in the next couple of weeks. The pool will include a new water supply, replacing the murky city reserves with water from the Tidal Basin. This allows the pool to be routinely cleaned and (hopefully) won't gross out tourists. Other new features include nighttime illumination, renovated sidewalks, a tinted bottom, and shallower waters. 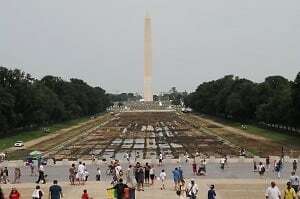 For the first time in 20 months, the National Mall won't look like Moses' failed attempt at parting the Red Sea. We understand, Reflecting Pool. We all need a face lift and some beauty maintenance once in a while. But we're glad to have you back.